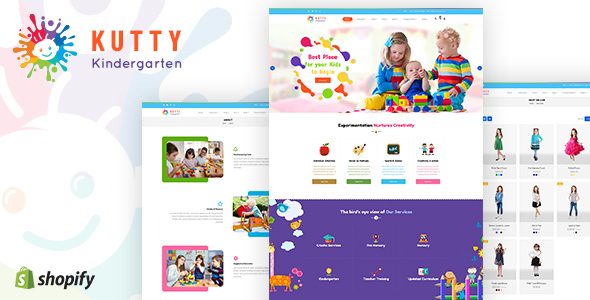 Kutty is a fashionable and colorful Shopify theme specially designed for online stores selling toys, kids clothing, and baby belongings. The theme is combined together with selected kids friendly fonts, colors, and animations that will exhibit what kids like in a cacthy look. The theme’s well-structured dropdown menu visualizes the best baby products that customers are looking for directly at the top of the menu on their first visit and quickly catch their minds. As well, the excellent products sections let you add your new, featured, best selling, and special products in proper and attractive locations. On the other hand, its created as an SEO friendly and fastest loading theme, whether you have lots of contents and products that all load in a short time without delay. As well, this is a responsive and mobile friendly Shopify theme created with awesome features like countdown timer, multiple currencies, advanced filters, carousel slider… So you can create a wonderful feeling for your clients when purchasing items from your website.